Isn't John Tory exactly the kind of mayor we all want after the disaster Ford years? He is a real consensus builder that will actually make an exceptional 65th mayor of Toronto. He is a candidate that is rare and worth supporting. I hope many will. I have always respected and admired John Tory. He is a decent, passionate, dedicated and exemplary public servant. It is no wonder that he is now the front runner in the mayoralty Toronto race. He is a candidate that is rare and worth supporting. I hope many will. I am his proud supporter and I hope he will become our mayor. Isn't John Tory exactly the kind of mayor we all want after the disaster Ford years? He is a real consensus builder that will actually make an exceptional 65th mayor of Toronto. I have known about Tory for a long time. I knew about his celebrated public service with the Canadian Football League, his work with great politicians such as one-time Toronto mayor David Crombie and Ontario Premier Bill Davis. He also headed the once mighty Ontario Progressive Conservatives and brought diversity, moderation and a new brand of retail politics to the legislature. In my enthusiastic endorsement of his candidacy, I reflect on the interview he gave almost a decade ago to the National Post as a newbie on his first day as leader of the Ontario PC party. He reflected how he wanted to be organic and "not to pretend to be something" he is not. He added -- "so I went to a number of people from different parties, and asked them for advice. The one consistent message that came through more than any other: Just be yourself." Look at the endorsement of Tory for instance -- an array of NDP, Liberal and Conservatives -- and compare it to either Chow's or Ford's. While Ford has no major endorsement forthcoming, Chow's supporters are just from the NDP and that is unfortunate for someone who aspires to be mayor. Do we need a partisan politician at City Hall especially in the mayor's office? I do not think so. Chow believes government is the answer to all ills in the world while Ford thinks government is an exclusive club of taxpayers rather than citizens. Tory is an inclusive and believes we need everyone at the table to move us forward. We need a competent leader of Tory's stature to help guide the city, bring maturity to local government and bring us all together as a Toronto family. I have no doubt John Tory can do that and that is why I am excited with his candidacy. I became more familiar with Tory's dedication to public service personally via CivicAction which he headed at the request of David Pecaut -- often described as the best mayor we have never had -- in 2009 when the equally admired Toronto advocate was dying from cancer. In this entirely volunteer position, Tory dedicated countless hours to help meet the objective of the organization when he could have chosen to be a mere figure head much like Rob Ford chose to be at Deco Labels during his one-term mayoralty. 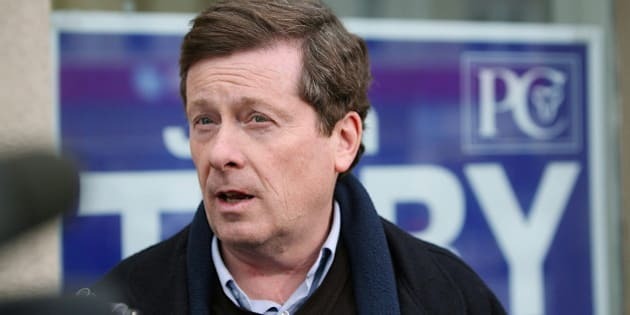 Tory opened up his networks, connections and his own personal wallet to make the cause of equity and diversity the forefront objective of CivicAction. Today, the organization claims to have achieved "a road-map to help ensure that the Toronto region's leadership landscape becomes as diverse as its population and draws on the growing number of visible minorities and recent immigrants who live in the region." In the process, he made us all feel like first class citizens in a beautiful multicultural city. When my friend, Justin van Dette, nominated John Tory for the Order of Ontario in 2012 -- he described him as a "consummate champion for the Greater Toronto Region." I am glad the then lieutenant governor agreed and awarded him Ontario's highest honour. This follows his awarding of the Harry Jerome Awards -- an honour usually reserved for African-Canadians. Clearly, Tory is no stranger to a Toronto, whose motto is "Diversity Our Strength" in practice. I believe he will make a formidable mayor and that is just why I am supporting him.